This is a sponsored post written by me on behalf of At Home. All opinions are 100% mine. Seas and Greetings friends! The holiday season is starting and I always feel so rushed and behind in getting our home decorated. With our kitchen renovation happening, life and the house are already a bit chaotic. This year I’ve decided to get a head start on the decorating in a few rooms, in hopes that we can all relax and enjoy a few pretty spaces in lieu of the drywall dust, contractors, and boxes everywhere. My home office is where I spend a large portion of my time so why not start there? 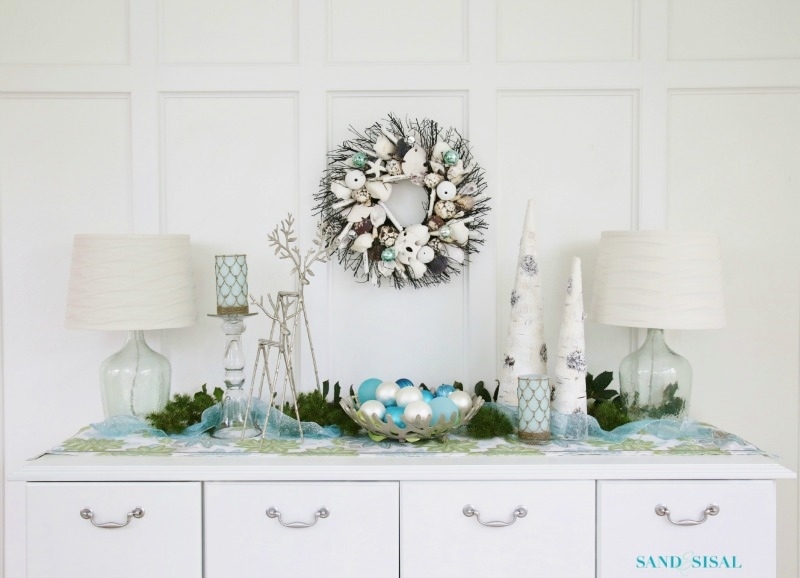 Today I am excited to share with you a beautiful turquoise and lime Coastal Christmas Vignette. For the coastal vignette in my office, I chose to mix and match a few of the themes. 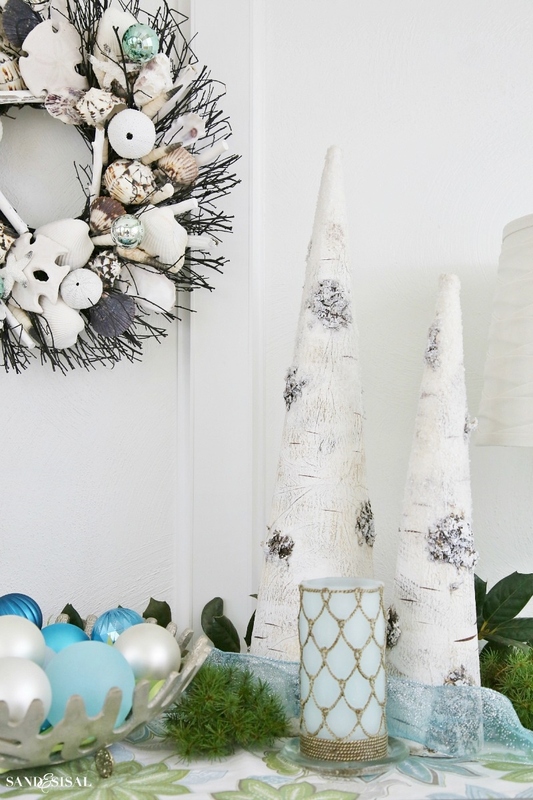 These pretty papery white birch bark tree cones are from the Forest Fairy Tales collection. 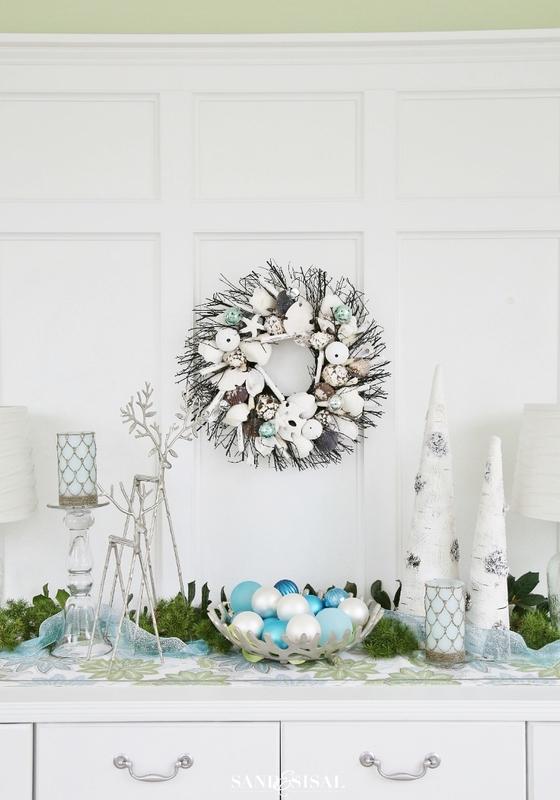 The coastal wreath was one I already owned, but I gave it a holiday touch by adding a few small glass ball ornaments and jingle bells. 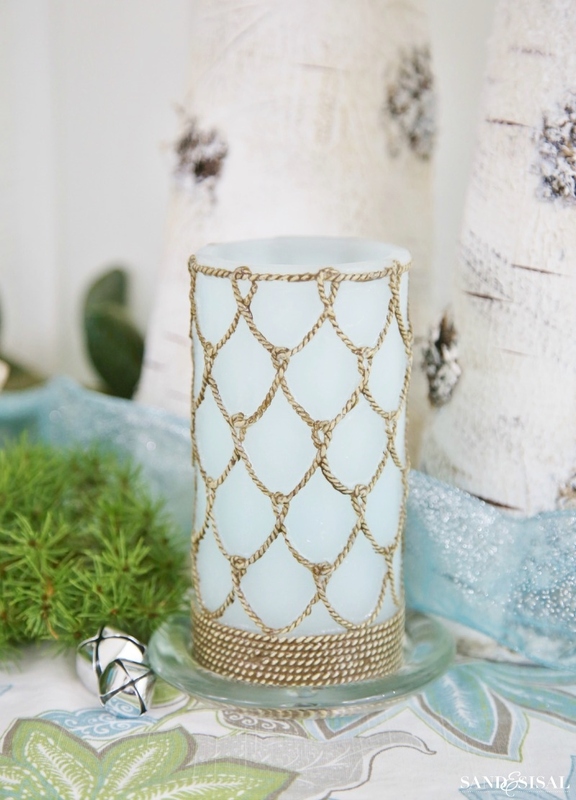 The nautical rope LED candles and shimmery, sheer, tuquoise ombre wired ribbon are from the Seas and Greetings collection. I was excited to find a paint can container filled with tons of silver jingle bells in assorted sizes. I can’t wait to use those in more Christmas crafts. 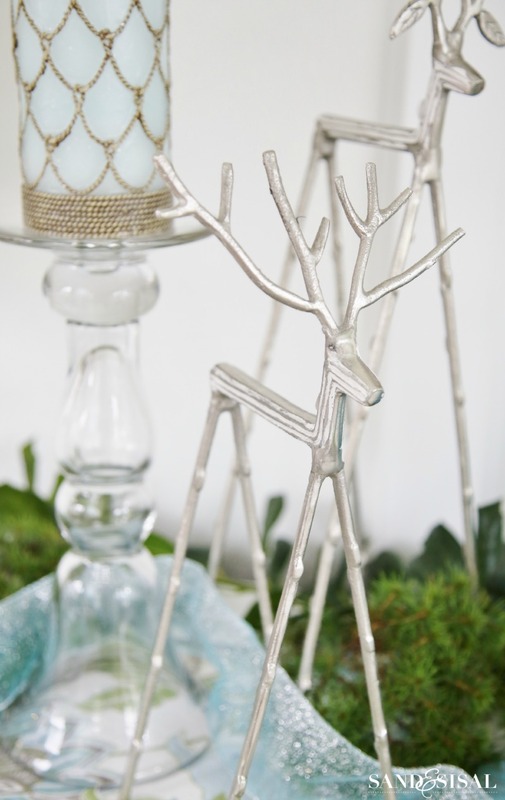 The second I saw these silver reindeer I knew I had to have them! They are part of the stunningly beautiful Snowcapped Scene collection. That aisle was like walking into a wintery white wonderland! My silver coral bowl was filled with a variety of both glass and shatterproof ornaments from At Home along with a few of my DIY Sea Glass Ornaments too. This is a very quick, easy and beautiful decor idea. It would make a lovely centerpiece too. In any vignette, it’s important to mix a variety of textures and sheens along with varying heights of items. It helps keep the eye moving and adds interest to your design. I also think that something alive, like greenery clipped from the back yard (or your neighbors yard… shhhh) gives your decor a fresh vibrancy. Holly and spuce clippings will a few weeks indoors without water, which is great! I’ll be heading back to At Home next week to pick up more Christmas items which I’ll share with you soon. If you are in the market for a new artificial Christmas tree, know that At Home also offers 101 Varieties of Christmas Trees! I hope you enjoyed my little Coastal Christmas Vignette. Feel free to check out their Tree for Me collection. 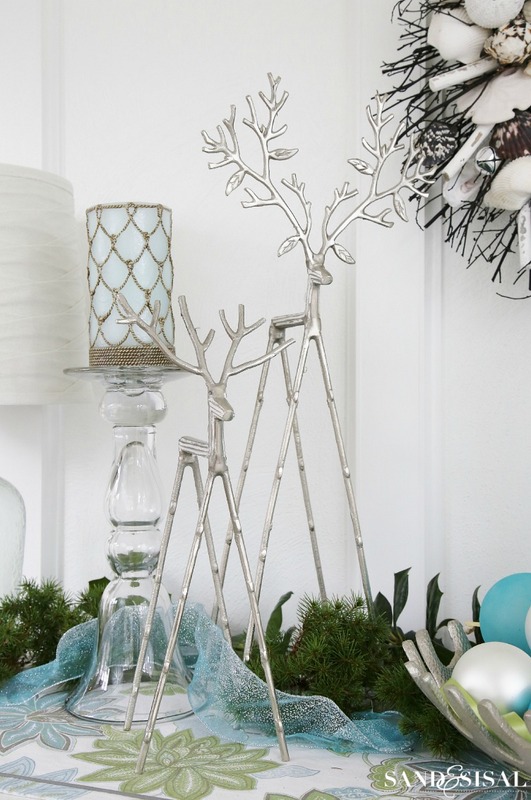 Let me know which At Home Christmas decorative theme would you choose for your home? Looks gorgeous Kim… you know I love all things coastal! Stunning! I love those LED candles…well I love it all! 🙂 Looks so stylish and chic! Oh wow Kim, this is just gorgeous! I love everything, especially those cone tree’s so pretty! I need to check out this company, you have me excited for Christmas now! Thank you Kristin! The trees are my favorite! I love everything about your vignette! I must find an At Home store near me! I’ve not heard of this store, but you did an amazing job with your tablescape! 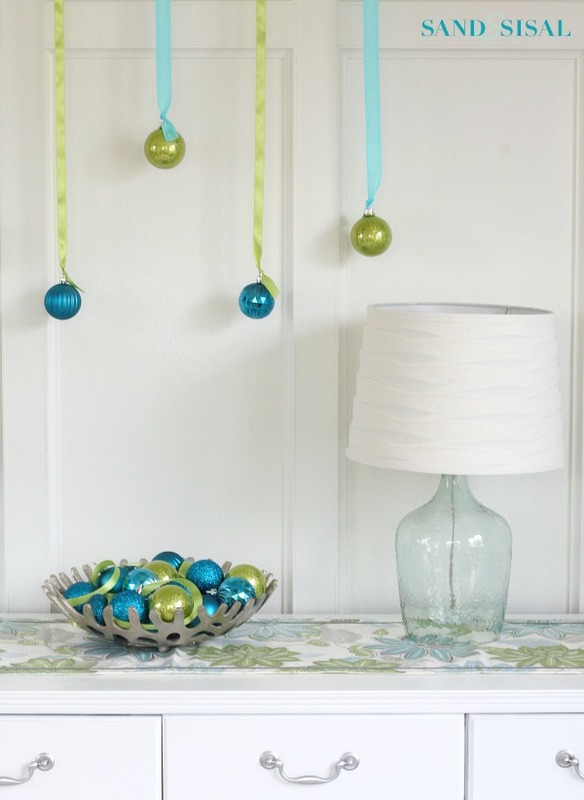 Thanks for the link to your DIY sea glass ornaments! Those are SO pretty! Thank you so much Sheila! This is so great Kim! I love those reindeer too! Perfect for your vignette 🙂 Come share at our Talented Tuesday party tomorrow at 8am if you get a chance! This is absolutely beautiful, Kim! 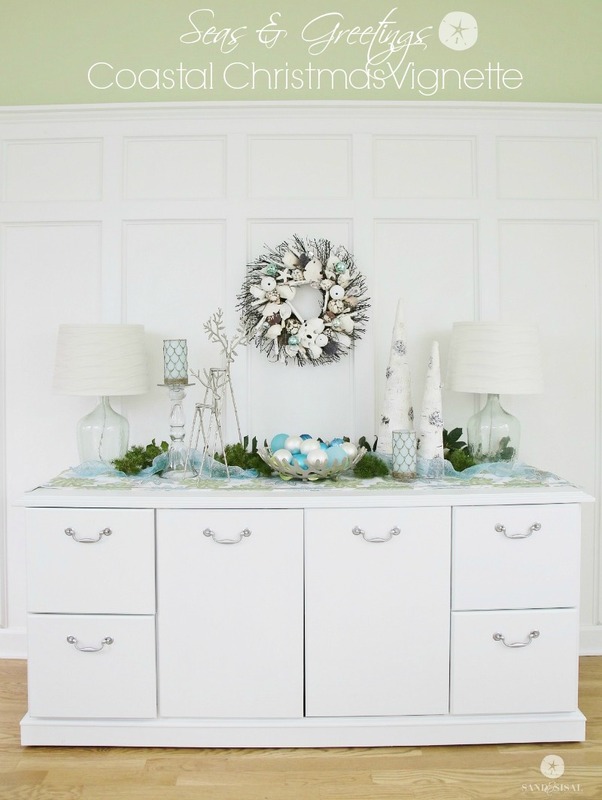 I love the wreath and the DIY seaglass ornaments are so beautiful! Really love your coastal Christmas office! 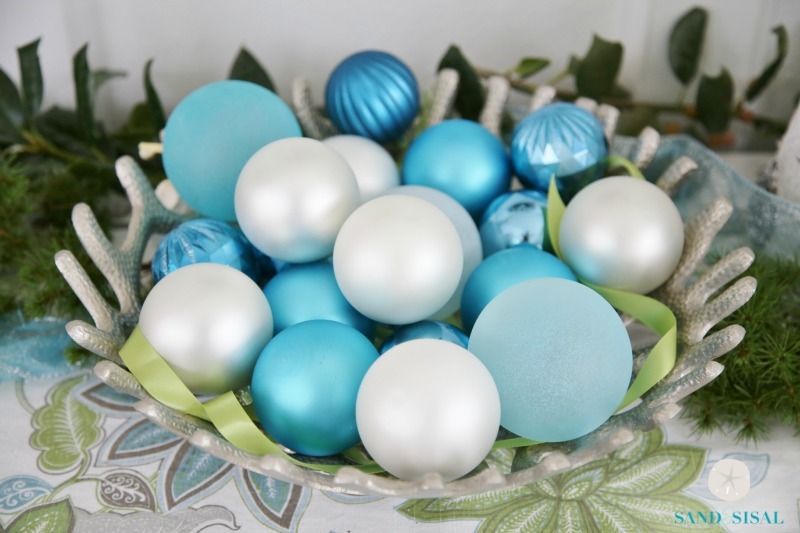 Can’t wait to make the DIY seagrass ornaments. Very creative! Curious where you got your file cabinet credenza. Would love to have something similar for my office/sitting room. Love this post? Let's keep in touch! Subscribe for free to have Sand and Sisal delivered straight to your inbox. Kim Wilson is a participant in the Amazon Services LLC Associates Program, an affiliate advertising program designed to provide a means for sites to earn advertising fees by advertising and linking to amazon.com.